Aïda Gómez was born and raised in Madrid, Spain. She studied sculpting at Kunsthochschule Weißensee in Berlin (Germany) and Fine Arts at the UCLM in Cuenca (Spain). She now considers herself a “street worker”, dedicated to creating interactive public art pieces that encourage connected-ness and community. Through her creations, she intends to spur conversation that re-imagines the use of public spaces. Her mission is to raise awareness on social cohesion while turning passers-by into playfellows in her self-appointed playground on the streets. Aïda is known for creating public word search games on billboards, weaving hearts into fences or playing Tetris with missing pieces in a subway station paneling. She uses simple yet subversive techniques and what she calls non-violent materials to reveal hidden treasures in public spaces. 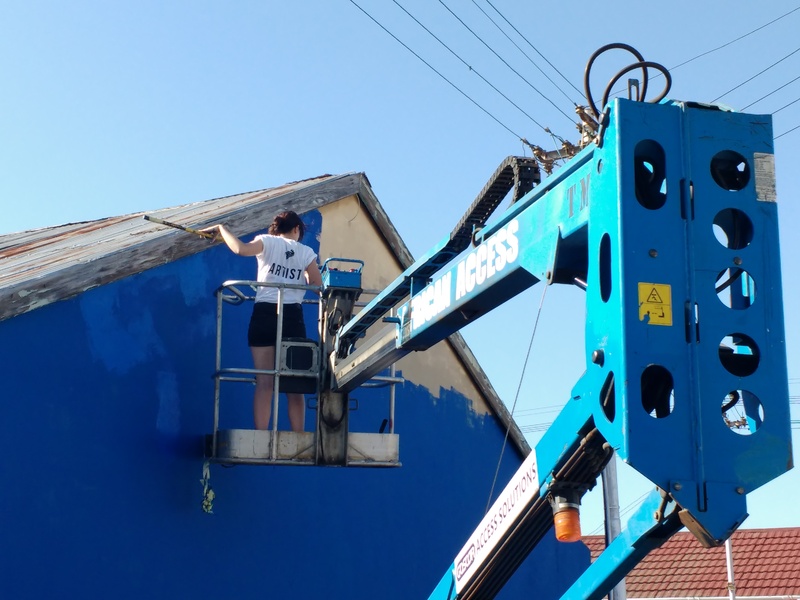 Her contribution to the International Public Art Festival [IPAF 2019] which can be found on corner Tennyson, corner Fenton Road was based on humanity’s need for human contact. This contact and the way in which we interact is however changing with the ever-evolving use of new technologies and it is not clear if these new innovations serve to bring us together OR to distance us even more. 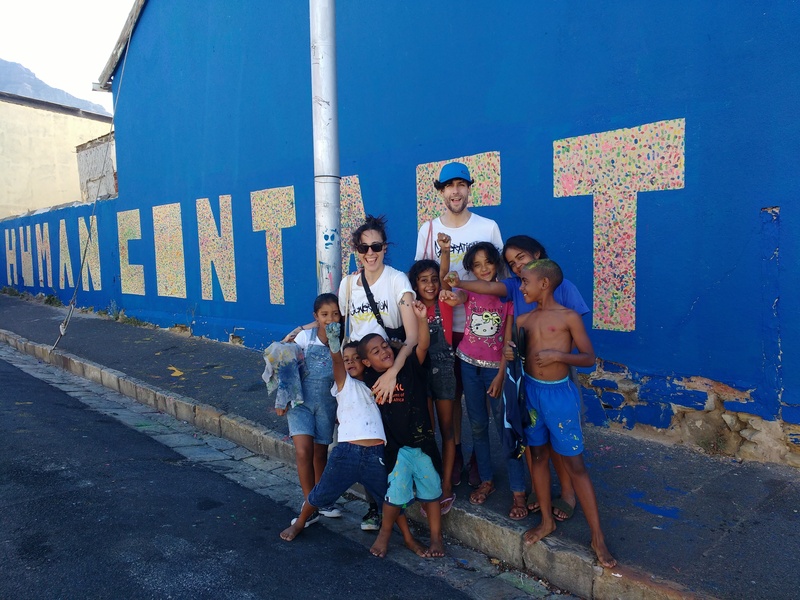 Aïda co-created her mural with of the Salt River residents and festival participants that spells out “Human Contact”. 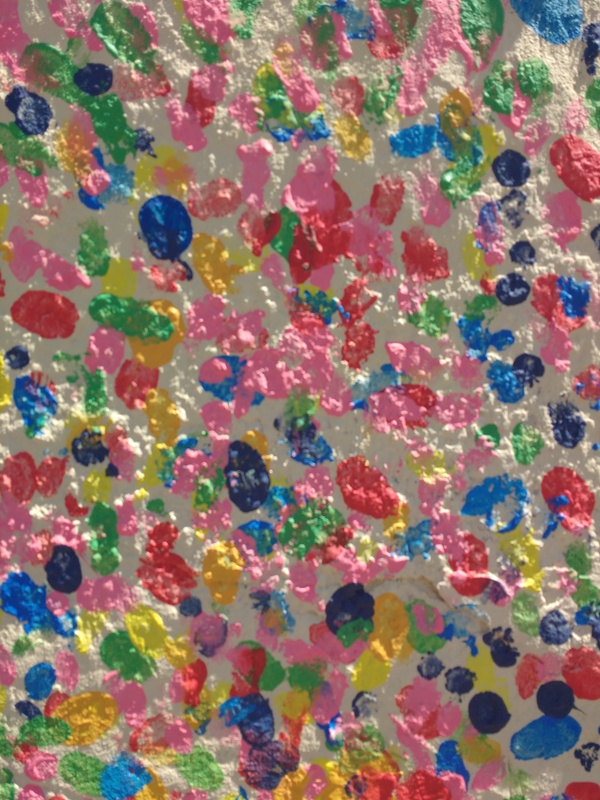 The mural is made up of thousands of fingerprints from participants that joined in on the festivities of the mural fair. The fingerprints used to compose this mural are used to handle smartphones, to represent our uniqueness as individuals or to physically touch each other. Each and every one of these gestures become a powerful tool if we learn how to use them wisely. The multi-coloured fingerprints bring light to each individual, their uniqueness and how despite the uniqueness they too are being affected with the change in the way we as humans maintain contact. Human contact once meant physical touch and time spent with physical people but has since evolved into our thumbs on the screen of a mobile phones. We are now able to reach thousands if not millions of people yet the quality of our contact with those closest pays the price. Aïda’s participation brought new light to public art in Cape Town through her methods of co-creation and her playful approach to murals. Aïda’s participation was made possible all thanks to the support of Accion Cultural Espanola’s mobility programme.